A range of handy accessories for use in any laboratory to make handling and processing of samples in microplates less laborious and more efficient. 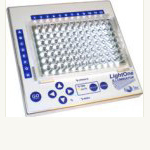 The LightOne is now also available in a 384 well format operated by hand or by an optional footswitch. In tracking of colorless reagents or marking progress on 96-well plate. Especially crucial tool when interrupted ormoving between samples or reagents as the lighter "remembers" where you left off. The concept is simple: an LED light is illuminated under specific wells, rows, or columns of micro-plate. Used to keep track of specific areas of a plate when filling, or indicate wells that need to be aspirated. To advance the light(s) to the next well or row, simply press a button on the unit, or use the optional foot pedal for hands-free operation.